It's done. As I was afraid of, our oldest dog just couldn't handle the slippery stairs so installing a runner became a high priority. I went to Lowe's on Saturday, haggled with the manager to let me buy 30' from a roll that was to be discontinued and was wrapped up on a palette in the back, and went to work. The straight run of stairs was very easy, but the wedge-shaped stairs were not. To put it mildly. In order to handle the turn, I decided to do what the pros do and make mitered cuts in the runner and bind the seams together to make the turn. I don't have photos of that, but you can see what examples I used here. With some projects, I finish up and think, "This would actually be a fun job to have. I wouldn't mind being a carpenter/mason/landscaper/etc." Not this job. Laying carpet would rank up there with plumber in my book of terrible professions. Here is the before--from when we went on the home inspection in August, 2005--followed by the after. When I look at these, I wonder what the hell I was thinking in doing this project. It looked fine before. 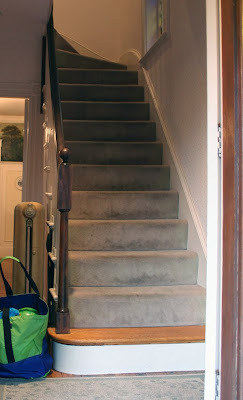 But then I recall how much I despised--yes, despised--that skinny newel post. It was wrong. It was an abomination. And the carpet was dull, dingy, and getting worn out. 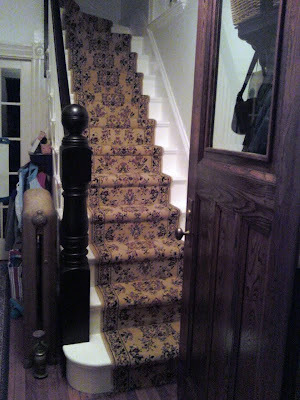 That carpet went up onto the second floor landing, which I ripped up when I gutted and reconfigured the landing and hallways. You can see the flooring-in-progress in the first photo of this post. So, it was necessary after all. And it does look better now. Very nice! I think it looks amazing. What's your next big home project, or are you taking a break? Thanks. I think I'll work on just finishing the stairwell/hallway -- mostly painting the walls, and some remaining woodwork left over from when I gutted the second floor. Since I'm so close with it, it makes the most sense to continue on this path. And painting is super easy, so I should be able to finish up in a weekend or two. That's exactly why we put the runner on our stairs! I'm glad you went with the rounded first step. Well done. From an outsider's perspective, the work was worth the effort*. Those stairs have class. Great job! Thanks, Lynne and Mike. The rounded stair was a must, and the whole thing does look classier than it did. Once I slap a fresh coat of paint on the walls, walking into my house will be an "Oooh! Aaaahh!" event. And then they'll walk into the rest of the house and the spell will be broken. Really nice. Love the new runner. Makes me want to, oh no, work on my own house.